St. Germanus, the glory of the church of France in the sixth age, was born in the territory of Autun about the year 469. He was brought up in piety and learning under the care of Scapilion his cousin, a holy priest. In his youth no weather could divert him from always going to Matins at midnight, though the church was above a mile from the place of his abode. Being ordained priest by St. Agrippinus bishop of Autun, he was made abbot of St. Symphorian's in the suburbs of that city, a house since converted into a priory of regular canons. 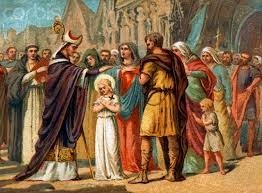 Fortunatus, bishop of Poitiers, who was well acquainted with our saint, tells us that he was favored at that time with the gifts of miracles and prophecy. It was his custom to watch great part of the night in the church in prayer, while his monks slept. One night in a dream he thought a venerable old man presented him with the keys of the city of Paris and said to him, that God committed to his care the inhabitants of that city, that he should save them from perishing. Four years after this divine admonition, in 554, happening to be at Paris when that see became vacant, on the demise of the bishop Eusebius, he was exalted to the episcopal chair, though he endeavored by many tears to decline the charge. His promotion made no alteration in his continual fasts and other austerities; and the same simplicity and frugality appeared in his dress, table, and furniture. In the evening at nine o'clock he went to the church, and staved there in prayer till after Matins, that is, in summer till about break of day His house was perpetually crowded with the poor and the afflicted. and he had always many beggars at his own table, at which no dainty meats were ever served; he took care that the souls of his guests should be refreshed at the same time with their bodies, by the reading of some pious book. God gave to his sermons a wonderful influence over the minds of ale ranks of people; so that the face of the whole city was in a very short time quite changed. Vanities were abolished, dances and profane amusements laid aside, enmities and discord extinguished, and sinners reclaimed. King Childebert, who till then had been an ambitious worldly prince, by the sweetness and the powerful discourses of the saint, was entirely converted to piety, and by his advice reformed his whole court. And so desirous did that prince become of exchanging the perishing goods of this world for eternal treasures, that, not content with making many religious foundations, to be nurseries of piety in all succeeding ages, and with sending incredible sums of money to the good bishop, to be distributed among the indigent after his coffers were drained he melted down his silver plate, and gave away the chains which he wore about his neck, begging the bishop, whom he made the steward of his charities, never to cease giving, assuring him that on his side he should never be tired with supplying all things for the relief and comfort of the distressed. In the year 542, king Childebert, together with his brother Clotaire, making war in Spain, besieged Saragossa. The inhabitants of that city reposed a particular confidence in the patronage of St. Vincent, whose relics they carried in procession within sight of the French camp. King Childebert was moved with their devotion, and desiring to speak with the bishop of the city, promised to withdraw his army, on condition he might obtain some portion of the relics of St. Vincent. The bishop gave him the stole which that holy deacon wore at the altar. Upon which the king raised the siege, and, at his return to Paris, built a church in honor of St. Vincent, and of the Holy Cross; which is now called St. Germain's in the meadows, and stands in the suburbs of Paris. Childebert falling sick at his palace at Celles, near Melun, at the confluence of the Yon and Seine, St. Germanus paid him a visit; and when the physicians had in vain tried every thing, all human means failing, the saint spent the whole night in prayer for his recovery, and in the morning laid his hands on him; and at the same moment the king found himself perfectly healed. The king relates himself this miracle in his letters patent, in which, in gratitude to God for this benefit, he gave to the church of Paris and the bishop Germanus, the land of Celles, where he had received this favor. The good king did not long survive. As the king had chosen the church of St. Vincent for the place of his burial, the saint, assisted by six other bishops, performed the ceremony of the dedication on the 23d of December, 558, the very day on which that prince died. The king likewise had built a large monastery joining to this new church, which he endowed most liberally with the fief of Issy and other lands, on part of which a considerable suburb of Paris has been since built. This magnificent edifice was called the Golden Church, the walls being covered on the outside with plates of brass gilt, and within adorned with paintings on a rich gilt ground.1 This church was plundered by the Normans, in 845, 857, 858, and set on fire by them in 861 and 881; but rebuilt in 1014, and dedicated by pope Alexander III. in 1163. The lower part of the great tower and its gate with the statues of Clovis, Clodomir, Thierri, Childebert and his wife Ultrogotta, Clotaire, and others, seem to be as old as the time of king Childebert. This prince committed the monastery and church to the care of our saint, who placed there monks under the holy abbot Droctoveus, whom he had invited from Autun, where he had formed him to a religious life. Clotaire, who succeeded his brother Childebert, was the last of the sons of the great Clovis; and united again the four kingdoms of France into one monarchy. On his removing from Soissons to Paris, he at first seemed to treat the holy bishop coldly; but falling ill soon after of a violent fever, was put in mind by some that were about him to send for St. Germanus. He did so, and full of confidence in the power of God and the sanctity of his servant, took hold of his clothes and applied them to the parts of his body where he felt pain, and recovered immediately. From that moment he always treated the saint even with greater honor than Childebert had done. But that prince dying shortly after, in 561, his four sons, Charibert, Gontran, Sigebert, and Chilperic, divided the French monarchy into four kingdoms, in the same manner as the sons of Clovis had done. That of Paris was given to Charibert or Aribert, Gontran was king of Orleans and Burgundy, Sigebert of Austrasia, and Chilperic of Soissons. Charibert sunk into a vicious indolence, yet was obstinate and headstrong in his passions not being divested of all the prejudices of paganism, he divorced his wife Ingoberga, and took to wife Marcovesa her maid, who had worn a religious habit; and after her death, he married her sister Merofleda, Ingoberga being still living. Our saint many ways endeavored to make him sensible of the enormity of his crimes; but finding all his remonstrances lost on him, he proceeded so far as to excommunicate him and the accomplice of his sin, to hinder at least the dangerous influence of his scandalous example. The sinners were hardened in their evil courses; but God revenged the contempt of his laws and of the holy pastor as he has often done, by visible judgments; for the criminal lady fell ill and died in a few days, and the adulterous king did not long survive her, leaving by his lawful wife only three daughters, two of whom became nuns, the third, called Bertha, was married to Ethelbert, king of Kent. affairs, hired two assassins, who dispatched him with poisoned daggers, while he made a halt in his march at Vitri, in 575, after he had reigned fourteen years, with some reputation of humanity, as Fortunatus tells us. Chilperic, by his tyranny and oppressions, deserved to be styled the French Nero, as St. Gregory of Tours calls him. He sacrificed his own children by former wives to the fury of Fredegonda, but having discovered her infidelity to him, he was, by her contrivance, murdered by her gallant in 584. Fredegonda was regent of the kingdoms of Soissons and Paris for her son Clotaire III., and continued her practices and wars against Brunehaut and her son till she died, in 601. Brunehaut governed the kingdom of Austrasia for her son Childebert II., and after his death for her grandson Theodebert; but afterwards persuaded Theodoric, her second grandson, who reigned at Challons, to destroy him and his whole family in fill. The year following Theodoric died, and Clotaire II., surnamed the Great, son of Fredegonda, inheriting both their estates, accused Brunehaut before the states of putting to death ten kings and St. Desiderius, bishop of Vienne, because he had reproved her for her public scandalous lusts, and many other illustrious persons. She had at first appeared liberal, and built several churches; but afterwards became infamous for her cruelty, avarice, restless ambition, and insatiable lusts, to which she sacrificed all things, and employed both the sword and poison in perpetrating her wicked designs. Being condemned by the states, she was put to the rack during three days, and afterwards dragged to death, being tied to the tail of a wild mare; or, according to others, drawn betwixt four horses, in 613. St. Germanus lived not to see the miserable ends of these two firebrands of their country. In his old age he lost nothing of that zeal and activity with which he had filled the great duties of his station in the vigor of his life, nor did the weakness to which his corporal austerities had reduced him, make him abate any thing in the mortifications of his penitential life, in which he redoubled his fervor as he approached nearer to the end of his course. By his zeal the remains of idolatry were extirpated in France. In the third council of Paris, in 557, he had the principal share in drawing up the canons. By his advice, king Childebert issued an edict commanding all idols to be destroyed throughout his dominions, and forbidding all indecent dances and diversions on Sundays and festivals. The saint continued his labors for the conversion of sinners till he was called to receive the reward of them on the 28th of May, 576, being eighty years old. King Chilperic composed his epitaph, in which he extols his zeal for the salvation of his people, and their affection and veneration for his person. He mentions the miracles which were wrought at his tomb, and says that sight was restored to the blind and speech to the dumb.2 He was, according to his own desire, buried in St. Symphorian's chapel, which he built at the bottom of the church of St. Vincent already mentioned. Many miracles manifested his sanctity, of which Fortunatus, then a priest, afterwards bishop of Poitiers, has left us a history, in which he gives two on his own evidence. Also two anonymous monks compiled relations of several miracles of St. Germanus, which Aimoinus, a monk of this monastery in 870, and a careful writer, digested into two books.3 The relics of St. Germanus remained in the aforesaid chapel till the year 754, when the abbot removed them into the body of the church. The ceremony of this translation was performed with great solemnity; and king Pepin thought himself honored by assisting at it. Planning for a wedding seems easy but it is quite difficult to find the right venues. The manager at these wedding venues were so wonderful, personable, and responsive. We received the best possible service on our wedding day.